According to the Handbook of Texas, “Shoal Creek (is) an intermittent stream rising in Central Travis County arid flowing south nine miles to join the Colorado River in the western part of the City of Austin.” Its small tributary, Little Shoal Creek, was covered over by a storm sewer in 1917 so that it is possible to drive by automobile along its former course where Union soldiers watered their horses in post Civil War days. It ran down San Antonio and Nueces Streets, had its head in a spring about Twentieth Street in the alley back of Newman Hall, and joined the mainstream near Fourth and Rio Grande Streets. Along the banks of little Shoal Creek was one of the largest Oak trees in the locality of Austin. 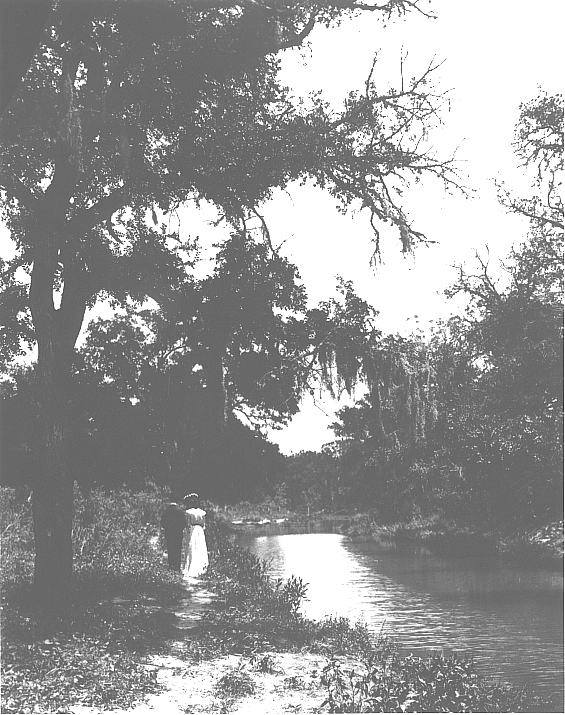 This tree was killed in 1865 by soldiers who washed their clothes in the stream and used the tree as a rub board.Shoal Creek was formed when the crust of the earth began to shrink and the area east of the Colorado River dropped below the level of the semi-mountains of West Travis County, leaving a crease down which the rainfall flowed. The creek is fed by deep springs out of sand and gravel from the Colorado River and is now usually dry. Time was when both Shoal and Waller Creeks were deep and never failing streams, but grading of the streets has reduced them to mere wet weather branches. (1) The geological formation is the Buda limestone once called “Shoal Creek limestone” until it was discovered that the name had already been usurped as a technical term. The underlying Shale is the Del Rio Shale or Grayson formation, which is an unstable rock that causes many building problems in this vicinity. Both Buda limestone and Del Rio Shale are well displayed along the banks of the creek. (2)Perhaps it was Edwin Waller who gave the creek its name because of the many shoals in it, for he laid out the town in 1839, and drew a map in which Shoal Creek is shown and named as the western boundary of Waterloo, later Austin. The creek on the eastern boundary received Waller’s own name on the same map. (3) On some of the older maps, Shoal Creek was recorded as Cascade Creek. The earliest patents along the creek, Issued between February and June of 1841 were to Jacob Harrell, James Rogers, George W. Spears and James P. Davis. Karma Powers, George W. Spear and James F. Davis. Of these four men only Harrell seems to have been of sufficient stature to merit mention in the Texas Handbook. (4)Currently the course of Shoal Creek followed beautiful thoroughfares: Lamer Boulevard and Shoal Creek Boulevard. Lamar Boulevard was a W.F.A. project begun in 1938 and finished in 1942. Lamar Boulevard runs parallel to Shoal by two from Twelfth Street to Thirty-first Street, end after a short hiatus, Shoal Creek Boulevard runs parallel to the creek from Forty-sixth Street to Sixty-fifth Street, not too far from the headwaters which are just south of NcNeil which are just in the vicinity of the magnesium plant.